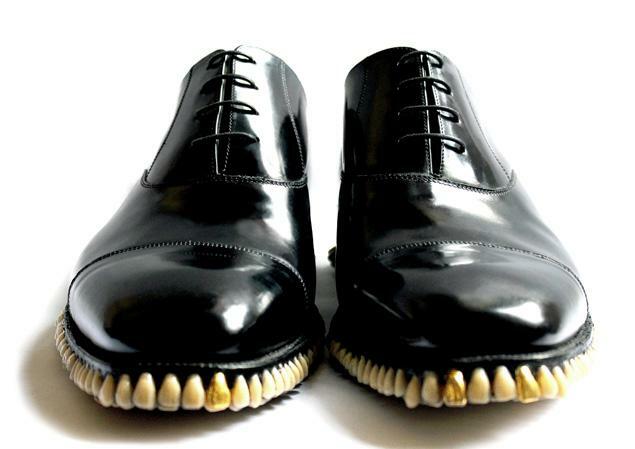 ‘Predator’ shoes have teeth for soles: Fine artists design Oxfords with dentures to go with suit made of human hair. 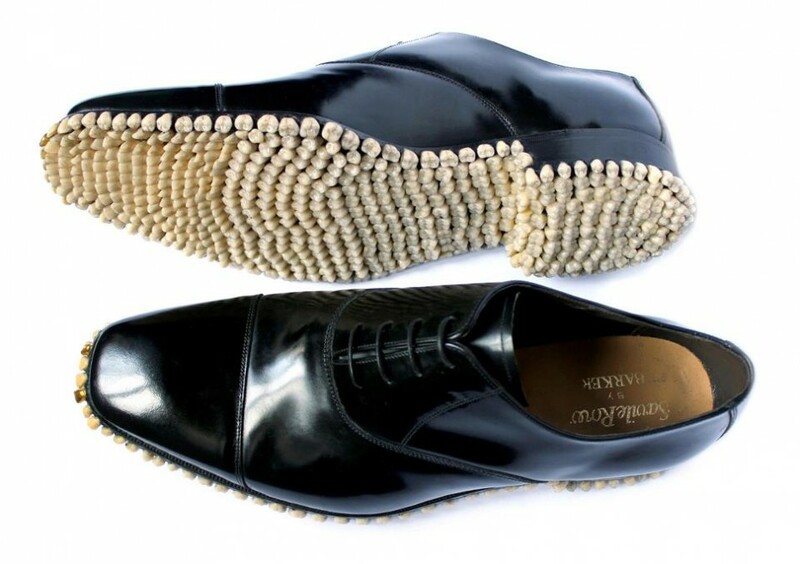 The ‘Apex Predator Shoes,’ a pair of Oxfords designed by a British fine art duo, are complete with 1500 dentures on the soles. The shoes pair perfectly with the ‘Predator Suit’ made of human hair and glass eyes. The viral success of Apex Predator allowed the work of fine artists fantich&young to catch the attention of design, fashion, technological, medical and counter culture web zines that then crossed over to mainstream media that included NBC Washington, New York Daily News, Metro Ru and ABC Good Morning America. 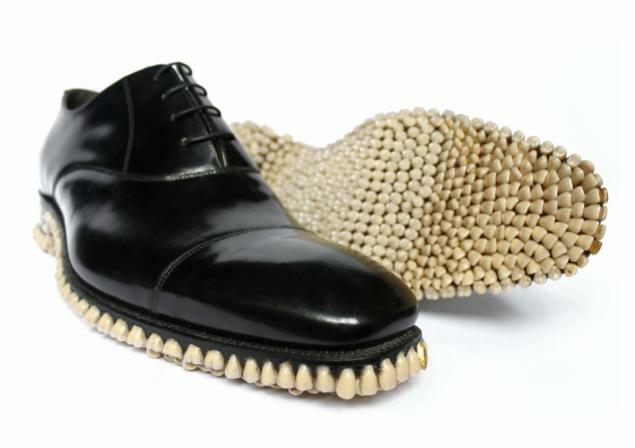 These traditional Oxford shoes whose soles are decked out with over 1000 denture teeth remind one of Meret Oppenheim Object in their subversive skewered surrealism. They share a creative dialogue with Modern Flint by the design duo Ami Drach and Dov Ganchrow in an amalgamation of the contemporary and the primeval. The art practice of fantich&young address’s parallels between social evolution and evolution in the natural world. Nature as model or nature as a threat. Apex Predator was inspired by Charles Darwin’s theory of evolution and natural selection and then subverting this with supernatural elements of pagan rites and ceremonial rituals. The concepts of nature and super-nature and viewing nature as model or viewing nature as a threat are instilled in their work. Fantich and Young view this process as Darwinian Voodoo, in terms of the logic and belief systems evident in science and magic this is contradiction, but contradictions create tensions and tensions create creativity and as artists they look for creative tension. The shoes were chosen for their style and size; the shoes reflect aspects of the political philosophy (“survival of the fittest”) of Herbert Spencer’s Social Darwinism and the financially related Economic Darwinism theory. Apex Predator was created in 2010 in response to 2008 financial crisis. 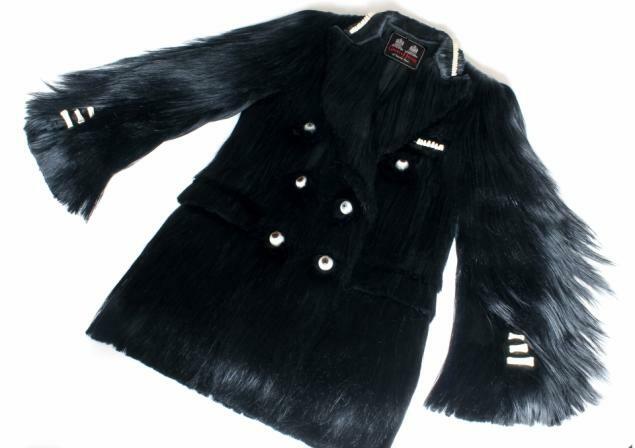 The work was created as a Fine Art sculpture in 2010 that accompanied a Savile Row hand made suit that was made of human hair, glass eyeballs, bones and a canine denture teeth. 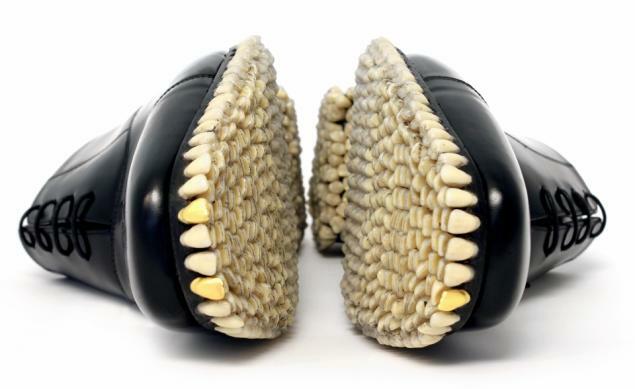 26.10.2012 | Filed under Excessus 2012, Автори and tagged with apex predator, contemporary art, darwinian voodoo, dentures, fantich and young, fantich&young, fine art, sculptures, teeth, tooth sole shoes.